Okonomiyaki – I couldn’t resist, so I ended up ordering the same Okonomiyaki (Japanese pancake) at Namu. So disappointing this time around! It was about 2 inches in diameter smaller than the one I had last week, but it had about the same amount of kewpie mayonaise (sweet mayo)! How gross! Black Bean Noodles – The special of the day, the black bean noodles, was actually really good. The chewy noodles were topped with a thick black bean sauce with cucumbers, eggplant and green onions. 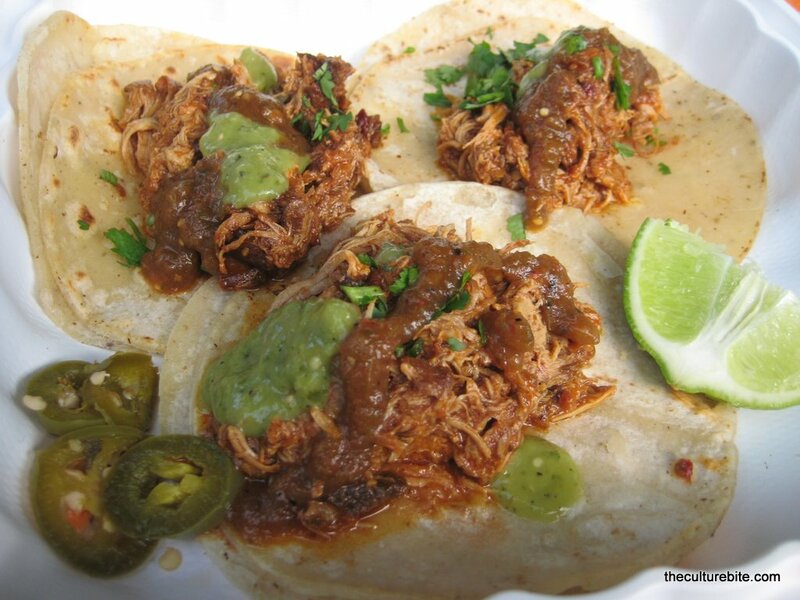 Shot-n-Beer Pork Shoulder Taco – A friend of mine (Hi, Niral!) was nice enough to buy me a Shot-n-Beer Pork Shoulder Taco from Tacolicious for my blog. Boy, that was good! Juices from the meat were pouring out of the taco each time I took a bite. The tacos were street-style – small corn tortilla with a choice of meat as the stuffing. Wow, this was so good! I’m definitely going to have to venture outside of Namu to see what else is at the Thursday Farmer’s Market. Next week, the Porchetta sandwich at Roli Roti! umm..i’m ashamed to say that after three years of working mere blocks away, I have yet to visit the farmers market! eek! but this post makes me want to go! wheee! you are so close to me!! when it stops raining, i’ll take you.